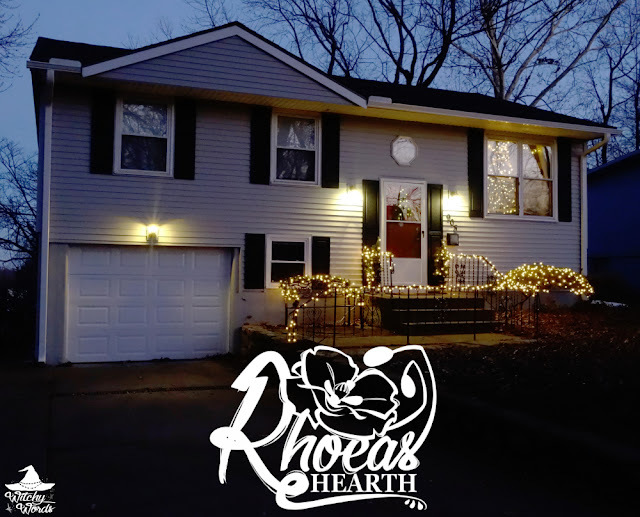 I have promised readers all year a look at our new home, Rhoeas Hearth. 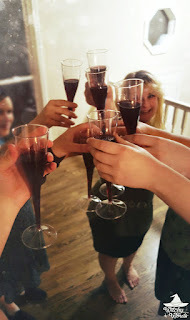 Now that the renovations are done, the housewarming party is out of the way and we're settled in, I can finally do just that! 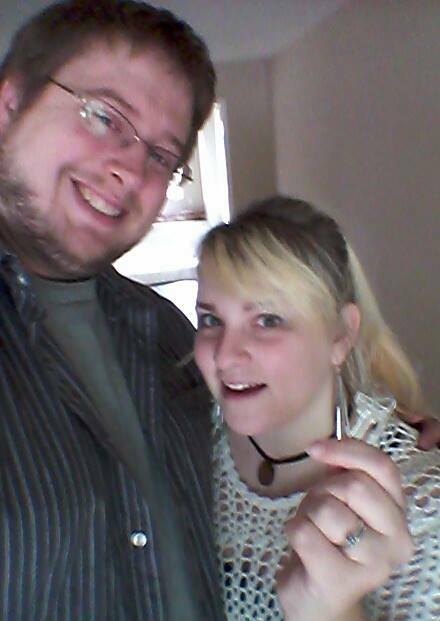 In August 2016, after moving three times in a single year from mismanaged landlords, my husband and I bought a house five years ahead of schedule! While the house we bought wasn't exactly what we were hoping for, it had been recently renovated: New appliances with warranties, flooring and paint. They had really done well on cleaning up the interior. The exterior needed work but the bones were good - it was simply dated on the outside. No foundation issues, no leaks, no siding issues. Our problem with the house was primarily that it wasn't open format, it was a raised ranch and that it had little character. We couldn't change the first two but the second was something we could work on. 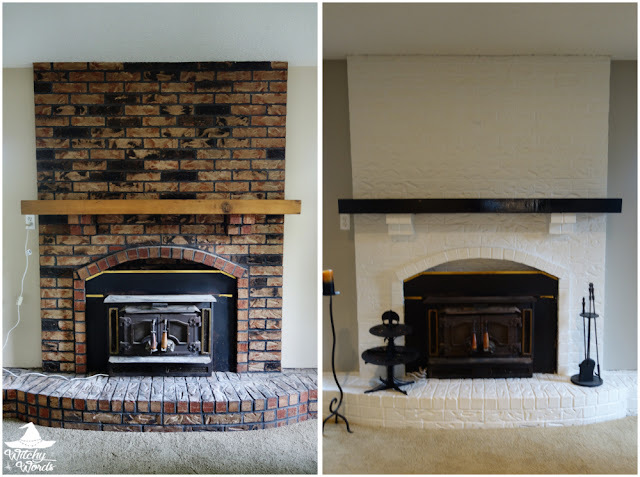 The same year we bought it, we gave it an updated coat of interior paint. 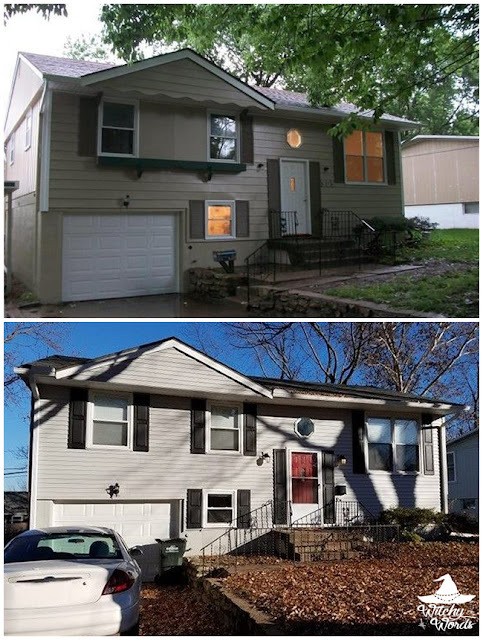 This year, we were able to fully renovate the exterior with new siding, gutters and roofing, a new coat of paint on the lower level, and new light fixtures, shudders and a mailbox! Above is what it looked like when we bought it - complete with an ugly 70's carport, a green faux planter and this horrible tan and brown color combo. The mailbox looked like it had been painted a few times, and the various coats were scratched to show through. Overall, it needed something to make it gleam. The picture below that shows the completion on our home. We went with a light, clean gray, black french shutters, a wall mounted mailbox and a bright red door. Even the neighborhood kids trick-or-treating this year complimented our house. I had really only planned on getting the roof done this year. Instead, our house looks like an entirely different one from when we bought it! 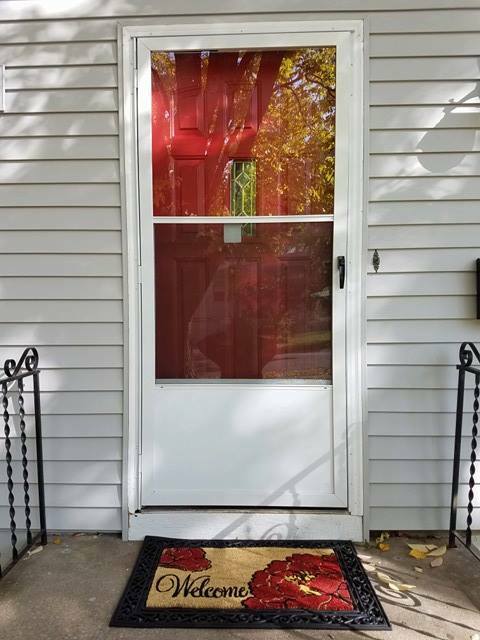 This was before my husband and I installed the shutters around the door but it's the clearest picture I have of our door and welcome mat. Rhoeas Hearth takes the initial word from the scientific name for red poppies, a reference to my current path as a witch. 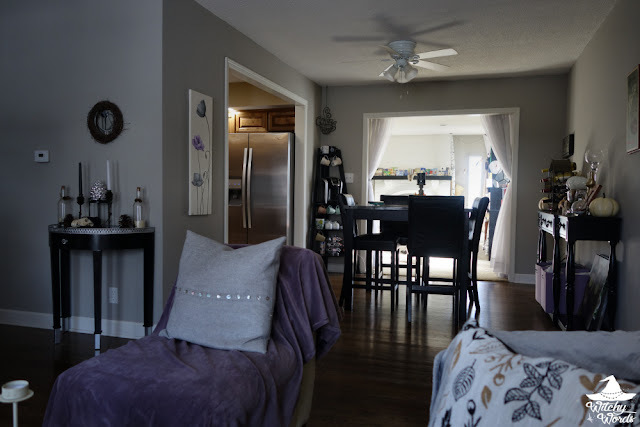 Finding a red poppy mat was important to me to connect my path, that name and the house together as one. The entry way shows the interior paint work we had done. That gray and lavender combo is unusual, and it's probably why I love it so much. I've spent a long time searching thrift stores, crafting and painting to make the rest of the house match. At the top of the stairs, I keep my sabbat altar. This is the main altar for the house and, since the circle and I see each other most for sabbats, it seems appropriate that that's what I use it for. 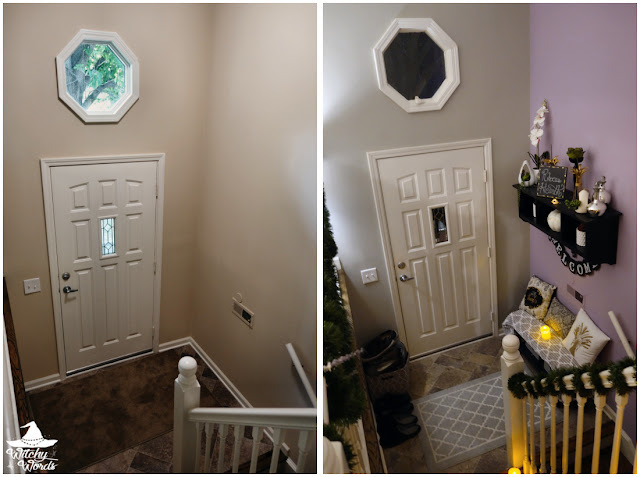 The difference between what we saw when we purchased the house and what it became when we finished is night and day (perhaps quite literally given the dark, dreary picture above and the bright one below!). 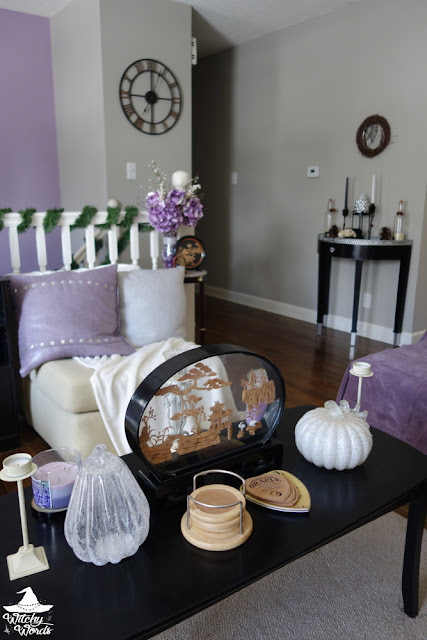 Every pillow, blanket, candle, flower, lamp - every item you see in the picture that is lavender - does in fact directly match that back wall. I know because I keep a paint chip in my wallet. ... the one next to the kitchen took me a few hours over the course of two days to paint as I prepped them before our housewarming party. Sometimes it shocks me as to how much a difference a coat of paint and some furniture can make in a space! I have to thank my friends for gifting me this gorgeous dining table! I was on a mad hunt for a black dining table and lost out on one in a swap and shop. The exact same day, Phaedra and Dawn got us this gorgeous high top table with a marble surface! It goes so perfectly with our decor - particularly with that console table behind it where I store wine and my altar to our cat who passed in 2012, Nyx. I'm saving the space above the console for wall shelves. I had purchased wall shelves in conjunction with the console table forever ago but they sold out before they shipped. I haven't been able to find the kind of wall shelves I want since. I'm working on it! My pride and joy in this room, however, is the coffee nook! I purchased this corner shelf, removed a shelf on it, screwed in some hooks and voila! A perfect quick-serve coffee station for my circlemates. I think they pretty much wholly stock it themselves anymore. This skylight lets in so much light to the space that I often think we've left the lights on when we haven't. I typically don't like skylights because they pose a leak threat but this one is apparently secure - not just according to our inspector but our roofers. Phew! It's so much cleaner. That dark and light brickwork is very 70/80s. I'm so glad it looks modern now. 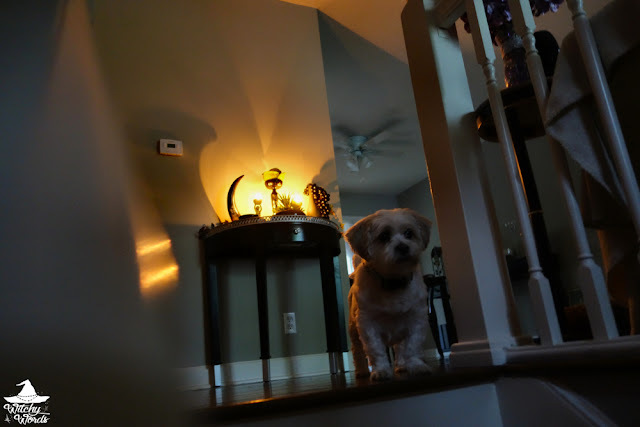 Anyway, onward down the hall. You might remember the library from the previous house. We ended up creating this after our roommate moved out, leaving us with a spare room we weren't sure what to do with. Now we just can't live without it! It gives us a place to relax, read our books and for my "altar to the retro" - or rather, my collection of old video gaming systems. It also gives a place for Artie to store the toys he's not currently "super into" at the moment. In the back corner, we have our office which is where I spend most of my time. The office is the last room we really had on the list of renovating. 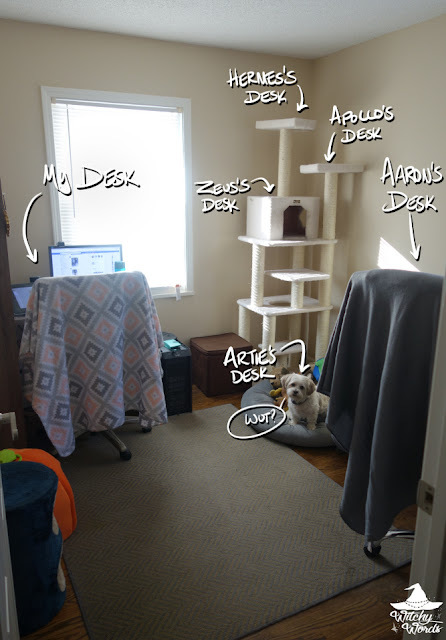 It's usually a scrounge of whatever desk I found at a thrift store that looked like it would work along with various pet hubs, cat trees and beds. I mean, if we're being honest, these things are kind of like their desks too, right? We've decided to go with a gray/taupe/driftwood color for our office. This is the first time Aaron and I have had matching desks! Not that you can see his in the photo, of course. Here's mine, though. This is my blog space, my work space and my game space. Not pictured are the three calendars I use to keep track of everything I do and my work cabinet - that's in the hallway. This is my little hub! Finally, we reach the bedroom. Not much has changed here yet. We extended the curtains a bit thanks to a pesky window that was ill placed for the room. I still need to get blackout blinds for that. I'd also like to change up our bedroom colors to a chocolate brown and sky blue, but that'll all come with time. I was able to get myself a vanity this year, which I'm extremely excited about! I don't have any jewelry of value, but I do like to have a place where I can just sit down and get ready. It's better than fighting for counter space in one of our bathrooms with pets underfoot. Definitely one of my top favorite purchases for the new house. We're also trying to hang more photos in the house. It's one of the things we avoided in previous houses because they were rentals and, oftentimes, very temporary. Hung pictures and frames say that we're not going anywhere any time soon. In the basement, we have the theater and the garage. I haven't really had a chance to work with the theater and get it up to date because one of our circlemates was utilizing it as her room for most of the year. That being said, now that it's back to being free, I can finally get some stuff done here! 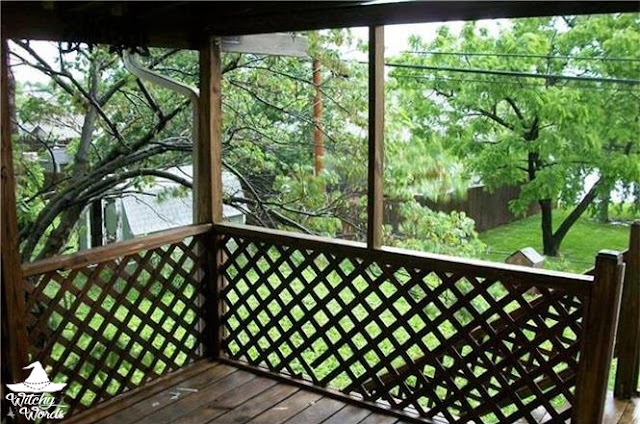 We also have a covered deck and yard! 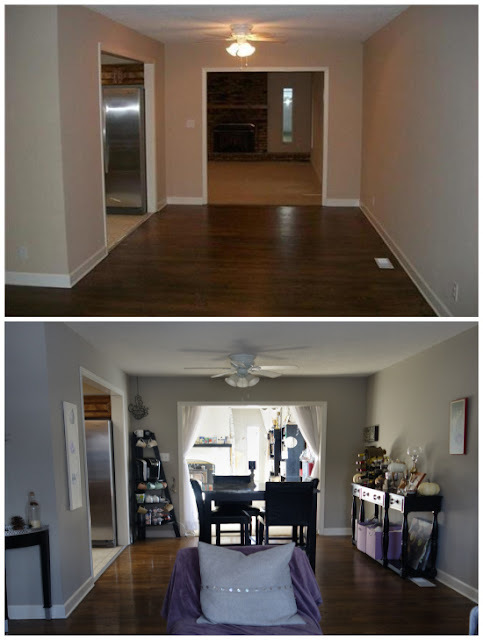 All of the renovations you've seen took place in less than a year. We had the walls painted November 21st and 22nd of 2016. The contractors for the exterior were hired in July and work was completed in October. We had the house painted the first week of November and completed installing the updated fixtures and shutters by the end of November. All of the new furniture came during the same time frame. And, somehow, we were still able to save. Next year, we plan to take care of the lawn. Very little grass grows here thanks to the enormous trees. Aaron and I would like to pull the old dog house out of the back yard and get a landscaping company out here. With all the weeds, grass likely won't be able to take root until they're cleared. We're going to let the pros handle that. Other than the yard, we plan on sitting back and enjoying our new home! This all certainly couldn't have been done without the help of our friends, family and readers like you who supported us and helped us through rough times. When the horror apartment was making all four of our pets and me terribly ill. When the landlord had to cancel on the 30 Day House - the Queen Anne from 2015 - because he had to foreclose. When we struggled to get Zeus veterinary help after spending $1500 on him and draining what little savings we had made over the winter after moving. It's been a rough go for us. But we're excited to see where we are now! Your home is gorgeous and has given me many ideas for my own home. Thank you for sharing all these steps. It is so inspiring to see this progress for you guys. I'm so happy for you and your family. Congrats and may 2018 be an even better for all of you. Thank you so much, Stephanie! We got very lucky with the storm this year (that is, if you can call 20k worth of damage "luck") in that we were able to get the insurance to cover the roof, siding and gutters, and the removal of that ugly carport. The light gray on the outside gave us a clean slate to work with. I have some plans for next year but they're small additions and tweaks. Nothing this drastic, for sure! 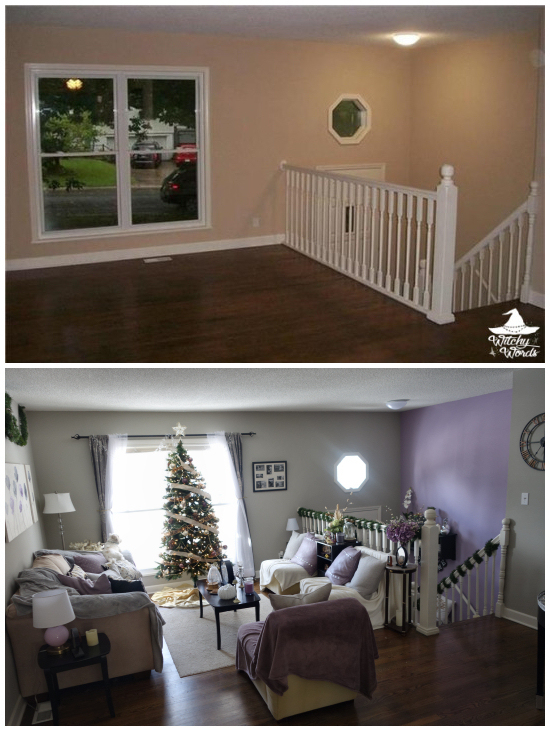 I wasn't sure about the lavender and grey when you first posted about your paint colors, but you really made it work. Thank you! My husband was apprehensive as well. You would think, after over a decade together, he'd trust my instincts. Besides, she who holds the cash makes the decisions, haha! I'm glad it looks as good as it does though. Thank you again!